The 5th District convention opened with a crowded field - seven candidates in all. But after three ballots, most had fallen by the wayside and the 220 delegates endorsed Ellison by unanimous acclimation. He received the endorsement after his top two opponents withdrew their names from consideration and backed Ellison. Ellison was obviously moved by the endorsement, wiping a few tears from his eyes before he took to the podium. 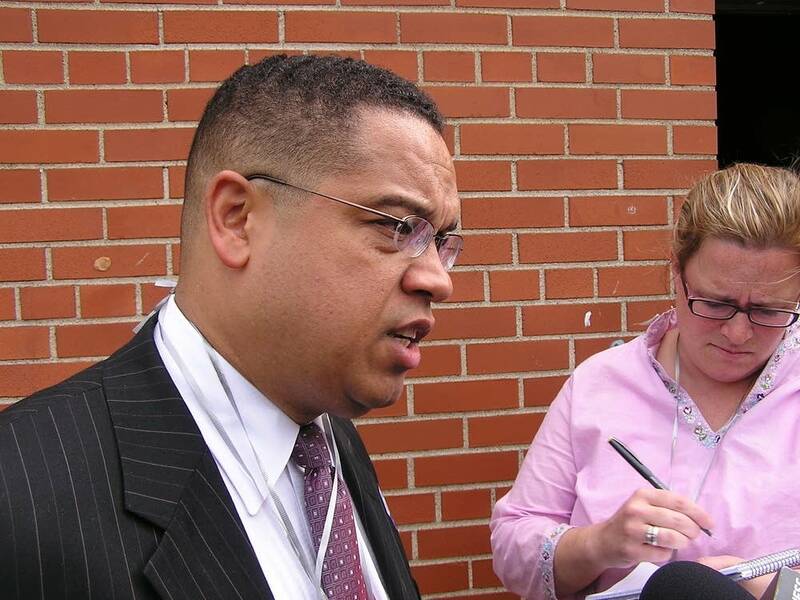 Once he reached the microphone, Ellison was energized and whipped the crowd up into a frenzy. Like most of his challengers, Ellison blasted the war in Iraq, and President Bush's policies. He says his campaign will focus on the peace movement, single-payer health care and reducing the nation's dependence on foreign oil. Ellison also rallied Democrats to get behind his campaign and the campaigns of other DFLers running for office. "We're starting to figure out that it's really got to be about all of us," he said. "We have to unify. We have to come together from the suburb and the city. We have to come together straight and gay, black and white, red and yellow. We have to come together." Ellison may also be making his unity call to discourage others from running in the DFL primary. The DFL endorsement doesn't guarantee Ellison a a spot on the November election ballot since several DFLers will run against him in a September primary. 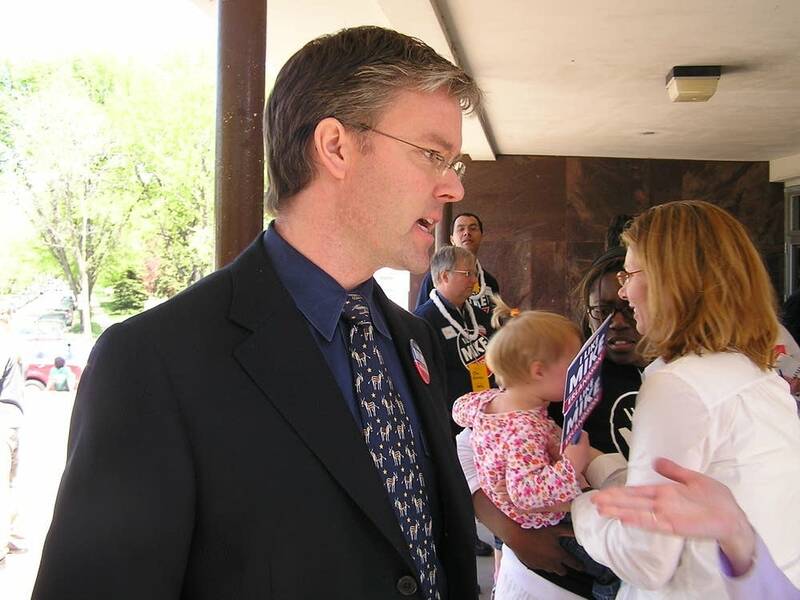 One opponent may be former DFL Party Chairman Mike Erlandson. Erlandson was Congressman Martin Sabo's chief of staff. He walked into the convention with his former boss' endorsement and intention of seeking the party endorsement. He later withdrew his name from consideration after delegates started heckling him for not promising he would abide by the endorsement. "Politics is about gut check time and I look forward to seeing you in September. Thank you very much and I withdraw my name from nomination," Erlandson said. Erlandson urged his supporters to stick by him but also said he'll take a couple of days before making a final decision about whether to run in the primary. Minneapolis City Council Member Paul Ostrow and Minneapolis Park Board member Jon Olson have already said they'll run in September, as did former state Sen. Ember Reichcott Junge. Congressman Sabo announced his retirement just two months ago, and Junge says voters need more time to consider the differences between the candidates. Junge says her experience in the Legislature and her campaign for attorney general in 1998 make her the best candidate. "My experience is far beyond any other candidate in this field. I also have the ability to mount a very strong primary campaign. I have run before statewide," she said. Junge lost her bid for attorney general when current Attorney General Mike Hatch defeated her in the DFL primary. The political makeup of the 5th District means the primary could prove more contentious than the general election. The 5th, which encompasses Minneapolis and several first ring suburbs, is considered a DFL stronghold in Minnesota. Republican Alan Fine, Independence Party Candidate Tammy Lee, and Green Party candidate Jay Pond are also running.